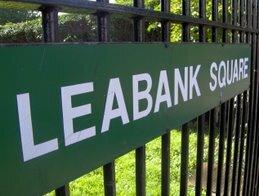 Leabank Square: Olympics, LSCA, Conditional Grants? What does it all mean? One weeks notice?! What about the activities we had planned for the school hols? OMG!!! Can she do this? Sona is this what the letter sounds like? Are the Olympics paying us to destroy all our hard work so that the garden can look like something they would like the public to see from over the canal? PLEASE don't let them do this - your gardens are one of the last bits of humanity surviving in the Olympic zone and important for a lot of people who don't live in the Square. Put that line in the sand now! whats the name 4 some1 who takes the money & easily bends over again? My copy says we should have 3 months notice, is it the same as yours? Can you believe how rude lsca & olympics are? After all these years of us growing our beans and pumpkins, and all they give us is a week to wind up? How rude!? ha ha - middle class mafia strike back man! I told you none of their interior designers rate purple! so is this letter saying that the olympic lot are paying the poshies to sterilize the purple garden? is it because the whole worlds meedja are right opposite and cant bear to see the site of us endaz actually having a life? and who made the poshies prez anyway? i don't member ever voting for them to wipe my bum! they want a middle class estate let them go find one. this is a woking class estate some of us actually work. we dont swan around smiling an wishing everyone else a good day all day long. Kiera here, I live at 63. I couldn't make the meeting on the riverbank yesterday, can someone who did update me/us about what's going on? Hey peeps don't forget PMMS in all this. Classic divide and rule pitting the tiny posh committee against the majority of us long term East Enders. I remember once being told that 'the kids on your estate have always been a problem' by someone in their office. Most my kids have grown up & left now, but she was referring to them at the time. If you smell a bit of tuna on Mr Nye's breath - it's not that he's been in the bins - he popped up for a visit again and shared some of our supper. I hope that's okay. The meeting was a complete waste of time. I had a list of all our concerns, and only a couple of them turned up. After an hour of waiting, I had to go to the dentist. No doubt a few more decisions were made on all our behalf after I left, but absolutely nothing was said about the Purple Garden at the 'meeting'. Aaaaanyway..... The next meeting is at 11.30 on Sunday, which promises to be a lot more lively. Please see if you can pop up with your comments & queries. We can have a catch-up and cuppa afterwards as well. This is just a polite request to keep your comments clean. Ours is an estate with fantastic caring residents, and when this kind of thing happens to us, we can get a bit wound up. But all our kids read this blog as well, so please keep it neat okay? How is getting a grant of 7K a bad thing? Nobody is disputing the hard work put in previously and no one is being excluded from getting involved. If people are going to be negative at the meeting tomorrow instead of working together, then we might as well send the money back to the ODA. its deffo not a bad thing at all. putting thise unfair condition on it to sanitize our estate is deffo a bad thing. The comments for this post are now closed. This is a bit disturbing and the letter certainly seems overly officious and pompous. There seems to be a pattern. Use the promise of "grants" (code for spending taxpayers' money) to coerce behaviour and to try to strongarm people into doing what they want. If they had wanted to do this, surely the right way would have been to discuss it properly first to get everyone on board and then tell Sona and Nadira in person? Good manners are free. This is so depressing - We will miss your innovative and inspiring garden. I've been walking on the opposite side to Lea Bank with my Springer Puppy Freddie, Square for a while now. What's happening? I've just read the letter on your blog, but what's happening now? Everytime I walked past your purple creations made me smile, I would be sorry to see them go. Am I too late?